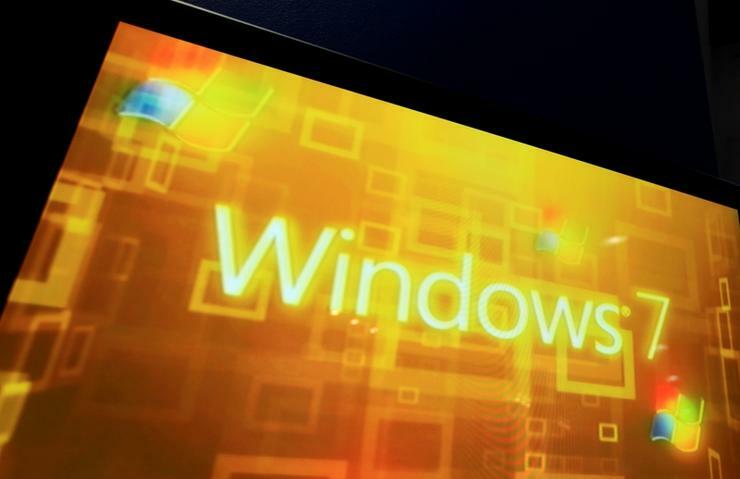 Microsoft Windows 7 may not go quietly into the night, according to data published Saturday. March's Windows 7 user share -- an estimate of the percentage of the world's personal computers powered by the 2009 operating system -- was 49 per cent, said analytics vendor Net Applications. However, Windows 7 ran 54 per cent of all Windows machines: The difference between the user share of all PCs and only those running Windows stemmed from Windows powering 92 per cent of the globe's personal computers, not 100 per cent. More importantly, Windows 7's share has barely moved in the last 12 months. Since this time in 2016, it's dropped just 2.5 percentage points, representing a meager five per cent decline. 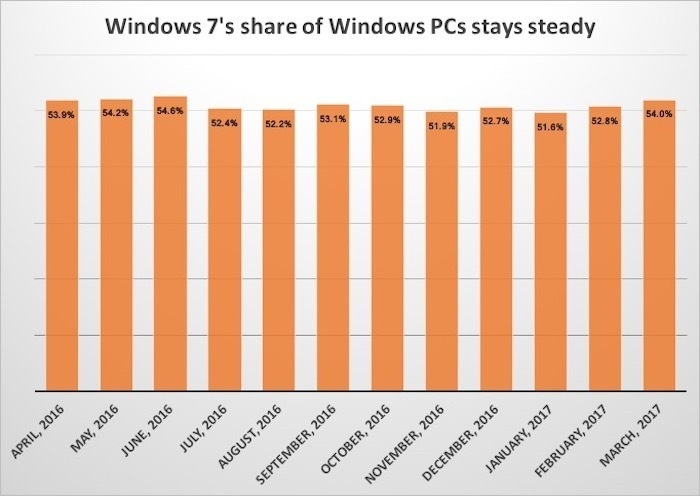 As a portion of just Windows personal computers, Windows 7 has been even more obstinate, remaining steady over the past year at 54 per cent. During the same stretch, Windows 10 added more than 11 percentage points to its share, ending March with 25 per cent of all PCs and 28 per cent of those running Windows. The long-retired Windows XP and 10's immediate predecessors, Windows 8 and Windows 8.1, gave up more share ground than did Windows 7 in the past year. Windows 8 and 8.1 -- Computerworld combines their numbers -- stood at eight per cent last month (nine per cent of just Windows PCs), or about half the peak of June 2015. While there's little doubt that Windows 10 will eventually supplant Windows 7 as the most widely-used desktop system -- just as Windows 7 replaced Windows XP -- there are conditions that may delay Windows 7's decline, perhaps even leave it with a larger share of PCs than did XP when Microsoft pulled its support three years ago. At the same point in its pre-retirement lifespan -- slightly less than three years to go -- Windows XP had shed nine percentage points of user share in the preceding 12 months, or three times more than did Windows 7. Admittedly, XP started with a larger share -- 58 per cent of all PCs, 62 per cent of Windows machines -- at the 33-months-to-go mark, but the rate of the decline (nearly 15 per cent) was also about three times that of Windows 7's sluggish downturn. Today's desktop climate, however, is very different than in early 2011, when Windows XP had less than three years of support coming. PC shipments in 2010, for instance, were approximately 350 million, according to research firm IDC. The number of shipments last year: 260 million. Most industry analysts have pinned responsibility of the shipment slide on consumers, who have dispensed with PCs, or added years to the interval between new PC purchases or decided that their current machine will be their last ever. That third possibility could prop up Windows 7's user share longer than under pre-slump circumstances. Consumers who have a working Windows 7 PC and plan to use that system until it dies, forgoing any replacement, then drop the form factor entirely, won't bother upgrading the OS. They will continue to run Windows 7, even as they power up the PC less and less often. Microsoft will support Windows 7 until mid-January 2020.